The Sao Paulo Birdfair held at the Butantã Gardens has to be one of the greatest venues to attend in South America, if not the Americas. It is just teeming with bird guides, exciting news, conservation projects and photographers. The date is always mid-May and run singlehandedly by Gustavo “Guto” Carvalho and his wonderful team, he brings together the best of the birding world in Brazil. Butantã is world famous for producing snake serum and the Gardens holds the marquis full of stands. REGUA has one small stand that is shared with other Rio birders and this makes for one of the most popular venues. We get to meet up with the birders, guides and tour companies to share news and comment on recent activities. Everyone is a member of a big extended family and we leave feeling fully revived and firing on all cylinders. The photograph shows Nicholas and Raquel with just a few of the people they met this year. Already looking forward to next year’s venue. 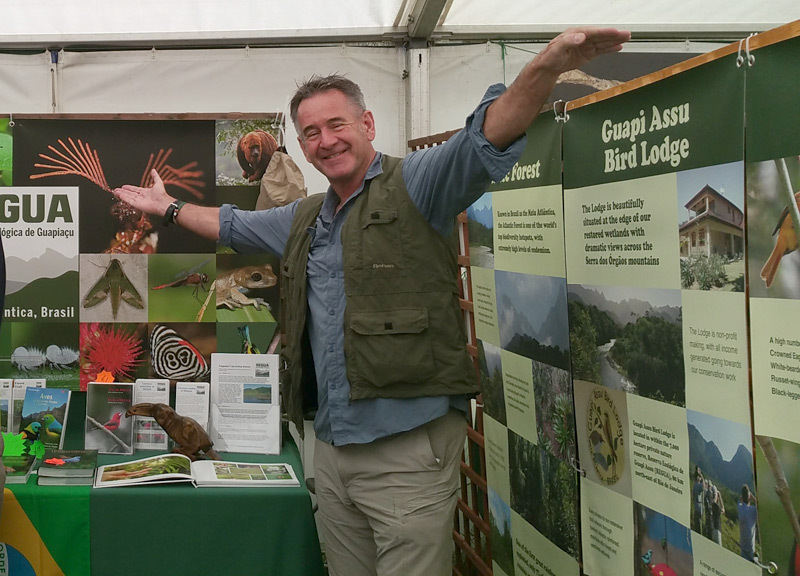 If you want to meet up with Guto, he will be at the UK Birdfair this August – our UK Team look forward to seeing him there. Last Friday to Sunday, tens of thousands of birders and wildlife enthusiasts descended on Egleton Nature Reserve at Rutland Water in the UK for the annual British Birdwatching Fair. This was the 11th year in a row that REGUA has been represented at this internationally important event and our stand was once again organized and manned by our dedicated volunteers, Rachel Walls, Lee Dingain and Sue Healey. Past volunteer bird guide Ken Sutton was also on the stand on the Friday and Saturday and did a great job helping out the team. 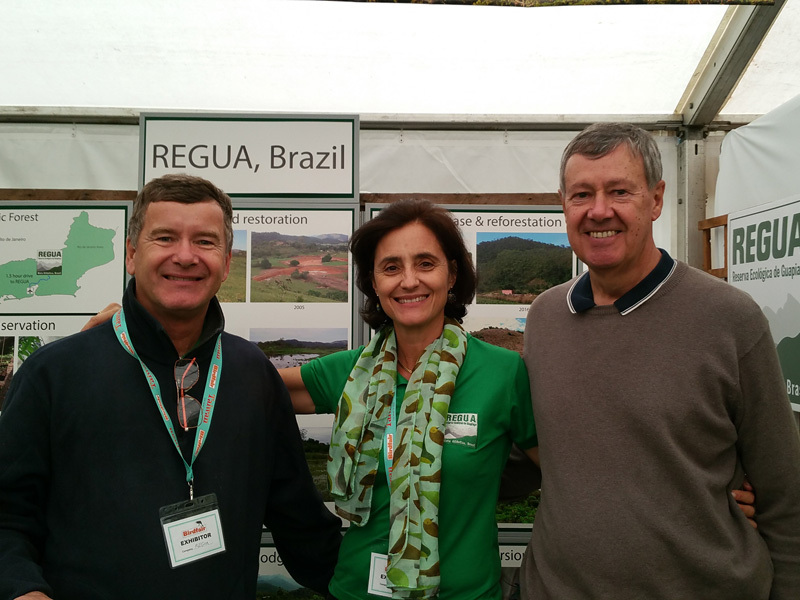 The Birdfair is the ideal place for us to spread the word about the excellent birdwatching at REGUA and how international birdwatching tourism is crucial in helping REGUA carry out the important conservation work protecting the Atlantic Forest of the Guapiaçu valley. Once again we had a huge amount of interest from birders and tour companies alike, and it was great to catch up with many past guests and supporters, as well as with our friends at the World Land Trust and Serra dos Tucanos. We’d like to say thank you to everybody who came by our stand and for helping to once again make Birdfair such a special event for us. It gives the whole REGUA team, both in Brazil and the UK, such a boost to receive so many compliments and encouragement. Also, we’d like to give a special thanks to Mr and Mrs Lee for making such a generous donation towards our land purchase and tree planting. If you have any enquiries about visiting REGUA then please drop us a email. We look forward to seeing some of you at REGUA soon. It’s that time of year again – the annual British Birdwatching Fair, better known simply as the Birdfair, returns to Rutland Water in the UK next weekend. This huge event attracts over 20,000 people and raises thousands of pounds for nature conservation every year. The Birdfair is the perfect place for us to spread the word about the excellent birding at REGUA and on our excursions in surrounding Serra dos Órgãos mountains and beyond, our beautifully situated bird lodge, and also to demonstrate how birding tourism is helping REGUA to conserve and restore one of the best preserved areas Atlantic Forest remaining in Rio de Janeiro state. 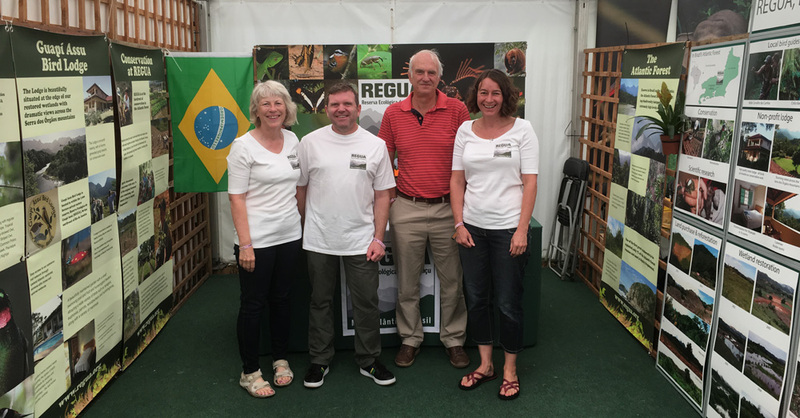 REGUA has had a stand at the Birdfair since 2007 and this year it will once again be manned by Rachel Walls, Sue Healey and Lee Dingain, along with past volunteer bird guide Ken Sutton will also be on the stand on Friday and Saturday. All of our publications will be available to buy (with a special Birdfair discount) and you’ll also be able to grab some free RAW Baking goodies from Rachel including her now legendary “Bristlefront Brownie” and “Fruitcrow Flapjack”! If you are going to the Birdfair then why not drop by the REGUA stand and say hello at stand 37, marquee 1. We look forward to seeing you there! The Birdfair will be taking place at Egleton Nature Reserve, Rutland Water, UK, from Friday 18th to Sunday 20th August 2017. It is always a pleasure to meet up with friends and especially REGUA’s past volunteers who have contributed so much to the project. This gives us the special feeling that we mutually benefited from opportunities at an important point of time. In the case of Henry Cook and Ian Loyd, nothing could be more agreeable than seeing them at the British Birdfair this year. Both had stayed at REGUA in 2013 to help guide visitors at REGUA and both are phenomenal birders and lovers of nature. Henry is currently working at a nature reserve in North Wales and Ian is now working for a wildlife tour company. We wish them all the deserved success and thank them for having spent time with us. Raquel and I attended the British Birdwatching Fair that took place from 19th – 21st August at at Egleton Nature Reserve, Rutland Water, UK, to mark REGUA’s 10th anniversary at this globally important event. Organized by REGUA volunteers, Rachel Walls, Lee Dingain and Sue Healey, with the additional support from Alan Martin, the stand offered a formidable team to meet the public with their interest and enquiries. The Birdfair is one of the best venues to present REGUA’s conservation efforts and results to date as well as showcase the great birds whose habitat it seeks to protect. Considering this was our first time at the Birdfair, both Raquel and I found it of overwhelming proportions given the number of marquees, stands and visitors present. So many visitors passed by the REGUA stand to say hello and we were touched by the compliments received from all those who had visited REGUA over the last few years. 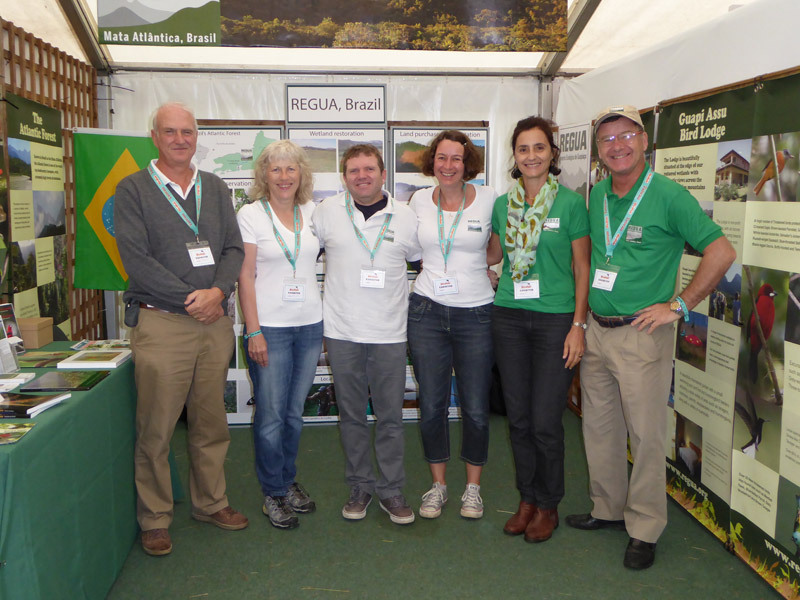 On behalf of the REGUA project and all those who work here, we wanted to thank everyone who came by to meet us or to say hello, but above all to especially thank Lee, Rachel, and Sue for their passion and zeal in the Birdfair preparation for what we thought the best stand ever, and to Alan and Ken Sutton for their attentive support in caring for so many visitors at the stand. Also, thanks to Ken Coppleston for carving a number of beautiful wooden toucan napkin holders (that we use in the lodge) for us to sell on the stand. 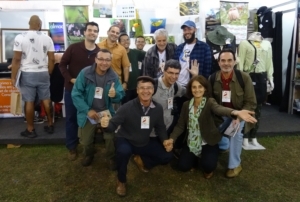 This year’s Birdfair coincided with the end of the World Land Trust Olympic Forest Reserve Appeal to raise £40,000 to purchase 221 ha of primary Atlantic Forest in the upper Guapiaçu valley and protect this as a reserve to celebrate the Rio 2016 Olympics (more on this shortly). 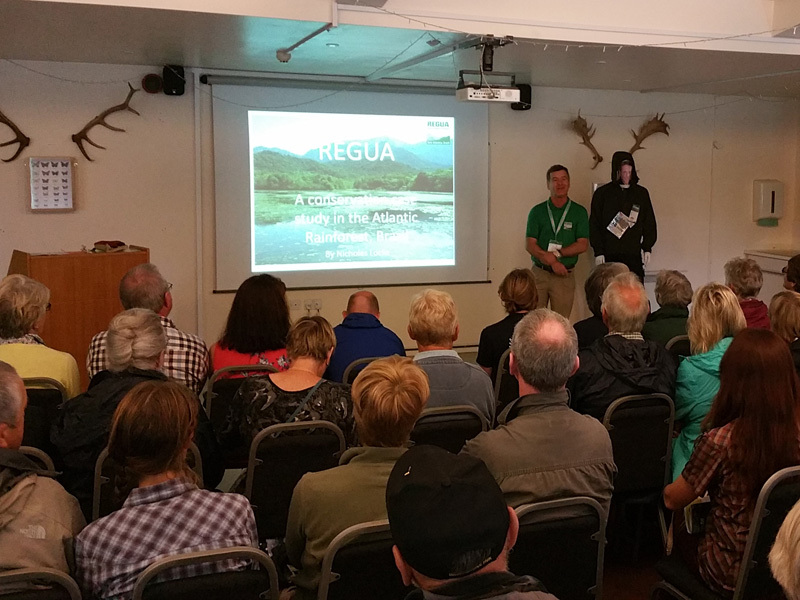 We were fortunate enough to have our Wildscreen film shown on the huge screen in the food court, and also for the first time REGUA gave two lectures at the Birdfair, both of which were very well attended. Thank you to everyone who came and supported us. We look forward to seeing some of you at REGUA soon. The British Birdwatching Fair, most often known simply as the Birdfair, is an annual event for birdwatchers that has been held each August since 1989 at Rutland Water in England. 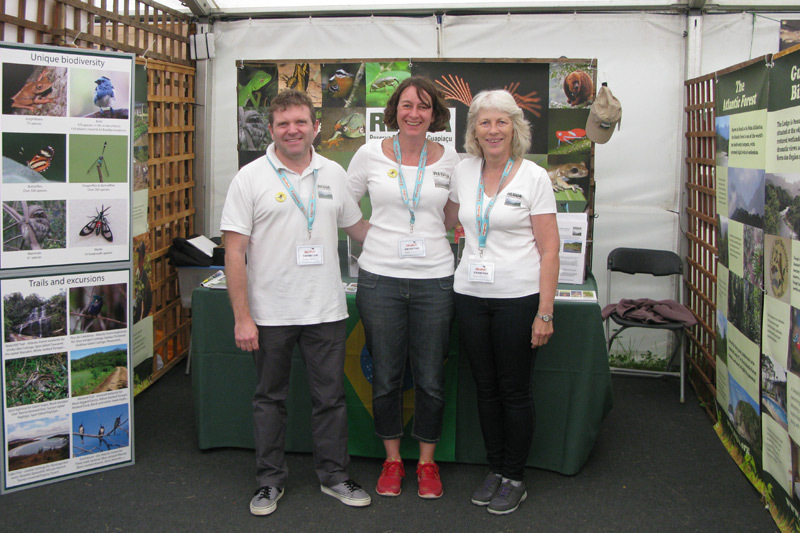 REGUA has been represented at the Birdfair by our British volunteers Rachel Walls and Lee Dingain since 2007, when we were invited by our partners, the World Land Trust, to use part of their stand. 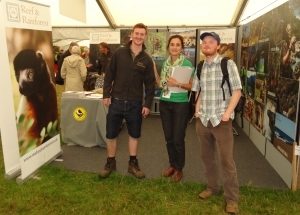 To celebrate our tenth year at the Birdfair, Nicholas and Raquel have flown to the UK to take part. Nicholas and Raquel will spending time with our regular volunteers Alan Martin, Sue Healey, Rachel Walls and Lee Dingain on the stand. In addition, our Wildscreen film, narrated by Michael Palin and produced by Verity White/Five Films, will be being shown regularly in the food marquee. If you coming to the Birdfair, make sure you come by and visit us in marquee 1, stand 37. We look forward to seeing you.